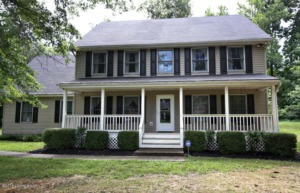 Beautiful and charming 4BR, 2.5BA in Shiloh Farms of North Oldham County. Enjoy the ride through beautiful countryside to see this lovely home that oozes Southern charm. Located in the outstanding NORTH OLDHAM SCHOOL district, this private, wooded, 3-story home invites you to sit on the front porch and enjoy nature. The huge kitchen has hickory cabinets, under counter seating and a large space for a farm table and chairs. The family room features a fireplace insert that keeps you warm during those cold winter months. The adjacent flex room could be a bedroom, study, or formal dining room. The sunroom behind the family room is a delight! You can sit for hours and enjoy the wildlife and woods. Upstairs, there is a large master bedroom with attached master bath, ample walk-through closet to a hidden study/office/sitting room. Two additional large bedrooms with walk-in closets and another full bath complete the second floor. For the ultimate in privacy, the third floor offers another enormous bedroom and a sitting area/office. There is so much to love about this home! 2-car attached garage. Click to schedule your showing.